The REAL Reason People Leave the Church! 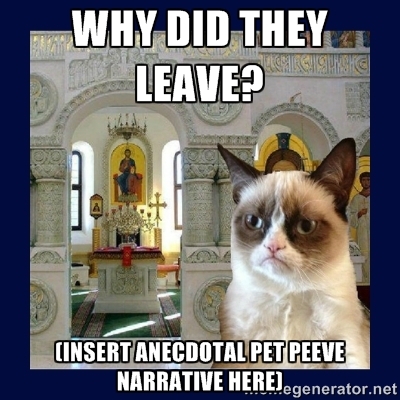 You are here: Home / Orthodox Christianity / Classes and Presentations / The REAL Reason People Leave the Church! Google “why people leave the church” and you will get a bazillion links to articles describing why people leave the church (okay, there may be fewer than a bazillion… I stopped counting at a hundred when I ran the search this morning). Put the same query in at Amazon and you will get similar results. In one sense, it’s a good thing that diagnosing church health and evangelism is such a huge industry (after all, we really do want to do better! ), but there is another sense in which it really misses the mark. The findings these experts present are presented as if they were definitive, but they aren’t. Why did they leave? Grumpy cat knows! There are two basic methods for discerning the truth: revelation and science; everything else is just marketing (which is a kind way of saying “manipulation”). I don’t know of any prophets who have received word from God about why people have been leaving the church (and wouldn’t trust anyone who made such a claim). Without reliable and directly applicable revelations, it really comes down to science. Almost all of the research on church emigration skips step 4. They provide enough information to describe why their hypotheses are plausible, but not to test them. In order to make a convincing claim to know why people leave the church, writers really need access to good, unbiased, data (and lots of it); anecdotal evidence is not enough. Telling good stories may get people to read their blogs or buy their books (I do both regularly! ), but it misses the mark. This is true regardless of who wrote the article. The opinions of a PhD, a priest, or theologian are not necessarily any better than the “man on the street” (0r “woman in the pew”), despite the fact that they are able to market their ideas better (through an appeal to their expertise, their likability, the assertion of their authority, and their ability to use all the right words… all of these make points seem true). That doesn’t mean that the articles and books are useless, it just means that you are more likely to learn about what the author thinks is most important (often something they were hurt by) rather than a serious analysis of why people have left. In fact, many of the articles are just lists of pet peeves about how poorly church is done in a particular place. Confirmation bias and the strength of our own experiences and opinions mean that at least some of these will resonate with us, but that is not the same as really knowing why people do anything (except read blogs and buy books!). The real value-added of such articles and books comes when they compare what we are doing in church with traditional Christian practices. They point out things like how important it is to welcome strangers, to preach Christ crucified (and risen), and to present the Gospel in a way that resonates with people, challenges them, and helps them grow. Such introspection is important (again, we really do want to do better! ), but that’s not the same as describing why people leave. It is possible to imagine a situation in which doing the right thing will actually lead people to leave a parish (and vise-versa; doing the wrong thing may lead them to stay)! All this is to say that pet peeves and measures of adherence to traditional practices etc. are interesting, but their relationship to church growth and decline – even if supported by anecdotal evidence – is only hypothetical until truly tested with good data. One final note on the unreliability of exit narratives. It seems obvious that the best way to find out why people did something is to ask them… but it’s really not. At least not always. Memories are plastic and provide a bare-bones framework that can accommodate all kinds of post-hoc stories and justifications. Eyewitnesses do this, and I am convinced that this explains the vast majority of NDE (near-death experience) visions. Explanations of anything, to include reasons for leaving, are sure to have been tampered to fit some kind of agenda, whether consciously or subconsciously. Moreover, psychologists have shown that feelings/intuitions/decisions come first (pre-cognitively) and that reasoning comes second, providing justification (with the appearance of cost-benefit analysis etc.) for decisions that have already been made. This is huge when it comes to exit interviews (and interrogations; I served as an army interrogator for several years). My working hypothesis is that people have a negative affect (fancy word for feeling or instinct) towards church and leave because of that. If you ask them why they left, they have big brains that will find very good reasons (that’s what brains do!) – but those reasons may or may not have been the originator of the negative affect. Psychologists have shown that when bad things happen, people overestimate the role of external factors and underestimate their own culpability. So, for instance, when we do something stupid like cut someone off while driving, we will tend to blame the situation (e.g. traffic) rather than our own inattention, etc. (it’s worth noting that we do the opposite when good things happen and that this is all reversed when it comes to explaining the actions of others). So when you ask someone “why they left”, you are unlikely to hear about their lack of commitment, idolatry, heretical beliefs, laziness, and other internal factors, but are sure to get a big dose of all the external factors that “drove them out”. Nor will it be easy to figure out which (if any) of the factors they described actually started them rolling towards the door (another quick bit of psychology: once someone has decided something is bad, confirmation bias and an instinct for consistency will make their decision increasingly inevitable). Go ahead, read descriptions of “why people leave church” (and certainly ask people why they stopped coming!!! ), but do it with discernment. Look to see what evidence the writers used and try to figure out what their prejudices are. There are some gems out there that are actually based on good data, but they are rare. So why do people leave the church? Your guess is as good as mine, but I do know this: I’ll go to the gates of Hades to bring them back into the fold. As I suggest in my post, these problems are real, but what we really need to do is change the affect. Addressing the concerns youth raise is part of that, but more is needed. Note that all of these narratives are dominant in the aggressively secular culture that surrounds our youth; they are ready-made solutions to justify why youth need not like going to church. These (and other) narratives will always be available, the real solution is found in making them irrelevant to Christians in the first place. I plan on providing a more in-depth review of the Barna Group’s findings and the solutions presented in their book “You Lost Me” (http://www.amazon.com/You-Lost-Me-Christians-Rethinking-ebook/dp/B005LOPNRU/ref=asap_bc?ie=UTF8) in a future post. Here is a wonderful article that turns the question; “why do youth leave the church” into the more interesting and useful “why would they stay?”, meaning; “what SHOULD we do?”! I want you to note that the article can’t make any claims about whether doing these things would increase the proportion of our youth that remain committed to Orthodoxy…. but so what? If we did these things, the ones that stayed would become saints and the ones who left would be making a conscious decision to forsake Christ and sanctification. As our broader post-Christian secular culture becomes increasing antithetical to Orthodoxy (as happened in the Soviet Union, BTW), it really will be that stark. FWIW, I feel the same when the topic of money comes up in the parish: if sacrificial giving (vs. dues) are the right way to do things, what difference does it make if other ways will bring in more revenue? The parish could bring in more revenue by fraud, theft, and protection schemes (or through intimidation and playing on vanity, to use more familiar approaches), but is that really the point? If we can’t keep parishes open by doing the right thing then what is the point? What god are we glorifying? Thank you, Fr Anthony, for pointing out the difference between true understanding/knowledge and marketing yet again. I especially appreciate your second comment and the link to the Synaxis blog post that turns around the original question by looking at it from the affirmative perspective instead of the negative. I’m of the belief that the more we focus on the question of why “bad” things happen the more we invite the continuation of those tendencies and even their justification. Asking the question presupposes the answer, or at least orients the mind around having to come up with a reason that explains the negative. By simply asking a different question we can reorient the conversation around the life-affirming and positive nature of the church as it is meant to be, the body of Christ, permeated with His unconditional love for every person. SD Michael—I agree with Fr Anthony –have no fear. Take a look at the article I referenced below. As far as I can see your kids are on the road to all three traits. I know we’ll all do our best to make sure it’s a “home run”. Amen! Say no to fear! After a brief review of the google results, I agree that most of the articles written are long on complaints and short on support. (For the record, my favorite pet peeve is the prevalence of “angry old men” in our parishes.) Most articles wax long on how the Church has “abandoned them” or ignored their needs versus perhaps more rightly complaining that they had not been properly trained in the faith to enable them to commit themselves to a Christian way of life. But I’m not convinced that the scientific method would actually work on this subject matter though. For a hypothesis to be validated, it must be “falsifiable”. So whatever hypothesis we might create regarding why people are leaving the church we must be able to prove that in at least one instance, our hypothesis is not the reason. So the issue becomes identifying such a hypothesis to test, and then attempting to replicate the results while keeping so many other variables under control. Seems pretty difficult and I’m not sure it would be a worthwhile effort in the time that we have and number of souls that there are to save. What would it take, 18 years of childhood and adolescence just to complete the “experiment”? In our simplistic reasoning, we like to think that by identifying the cause, we can resolve the effect. However, even if we were able to ascertain the reasons young people were leaving the Church that doesn’t mean that reversing or eliminating the causes would be enough to bring them back. I’m more encouraged by Fr. John’s approach of focusing on the “glass half-full” – what it is that we need to convey to keep the souls in our midst. In contemplating the traits discussed, I can identify numerous examples that I’ve familiar with in my that had at least two if not three of these traits. Many of whom I have known and continue to work with in the Church to this day. Can we replicate this environment for the youth that we’re charged to oversee and have them leave anyway? Two of these traits we can create and “control”. I think it’s worth the try to find out. It’s a great point about the difficulty of doing experimental research – and with souls on the line, it would be demonic. That’s why surveys and interviews are so useful. With large n studies, you can statistically see the independent effect of each variable (i.e. hold all the others constant). I agree on the half-full pastoral approach. My gripe is that people pretend they know what causes people to leave or stay – they may or may not. As you anticipated with your final paragraph (that made my day, BTW), even the effects of such uncontroversial approaches as “convert them; equip them; and evangelize them at home” may well suffer from confirmation bias and selection on the dependent variable (meaning that there may be people who exhibited those traits etc. who ended up leaving). Here’s the bottom line for me: love them, serve them, and evangelize them; build up and nurture the good already there and deny the bad nourishment so that it withers on its own (the pruning analogy gets used to often – there are rarely traits that need such drastic action… although I am sure it does happen). As you say, I think it’s worth trying to find out, but less because it gets them to stay (entertainment and empty praise might do that) then that is what we are called for (again, I am just echoing what you wrote – like I said, you made my day).